Every member of the military, law enforcement agencies, combat gamers and those involved in really rough and physical types of work deserve to have the best tactical knee pads that they can use while they are out in the field. Having the right pair can provide its wearer enough protection against joint pains, tears and other forms of knee-related injuries. Unfortunately, knee pads are often overlooked or neglected when it comes to combat or tactical gears. A lot of people think that they are not as necessary as having their plate carriers, bullet proof vests, military gloves or gear belts. And while they may not be as famous or attractive as a high-grade gun holster or a pair of high-tech night vision goggles, tactical knee pads offer a ton of benefits just as any other important military or law enforcement gear on the market. And just like any methodical soldier, police officer or gamer, we have conducted several researches, reviews and tests in order to find the best ones out there. Our hard work really paid off because we’ve found 3 of the best ones that are currently available the market. BLACKHAWK Advanced Tactical Knee Pads – when it comes to flexibility and comfort, BLACKHAWK’s tactical knee pads definitely won’t disappoint. The closed-cell foam padding from the front to the sides will ensure comfort and ease of movement. The straps can easily be positioned according to which is comfortable for you. Arcteryx Kneecap – this is a one-size fits all model, which means that the Arcteryx knee caps are shaped to suit the anatomical features or specifications of an average man, this means that they are built to fit the contours of your knees in the most comfortable manner. They are adjustable and the straps are also elastic for a better fit and comfort. And though they hug your knees, they will ensure ease of mobility. K-P Industries Knee Ultra Flex – do not be deceived by its hard appearance, because the K-P Industries Knee Ultra Flex Knee Pads are comfortable as much as they offer superb protection. The padding will not absorb moisture even if you get all sweaty or get soaked in the rain during combat, working in construction sites or simply doing your weekly gardening tasks. The pads are also jointed, which allows you to move freely without worrying about not being able to bend your knees. The rivets are hinged and are made of metal – to secure the knee pads and to keep them from moving or slipping downwards. The Ultra Flex knee pads from K-P come with elastic and woven straps that are held in place by their signature Speed Clip. You can feel at ease knowing that the knee pads will not bind your skin and can easily be removed and reattached. Arcteryx Kneecap – Because these are lightweight, you can easily carry them with you and strap them on for protection. Focusing on the straps, they are elastic and can easily be adjusted to prevent them from slipping and exposing your knees. The hard-caps extend from the top of the knees down to the bottom to not just keep your knee caps from being injured but as well as the lower parts of your knees. One thing that we have noticed is that it doesn’t offer much protection to the sides because the caps do not extend to the sides. K-P Industries Knee Ultra Flex – aside from comfort, the K-P Knee Pads are primarily designed to offer the best protection out there. The outer shells are flexible for better movement; at the same time, they are resistant to chemicals and withstand intense heat and really cold temperatures. The KP also sports a grip strip that keeps you from slipping, aside from that the strip also protects you against falls, bangs and sudden drops. One of the best protective features of this model is its ability to protect your knees from top to bottom and even the sides. Made of high-grade hard plastic, the pads are extremely durable. 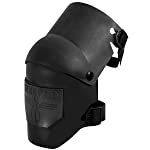 BLACKHAWK Advanced Tactical Knee Pads – this model is reliable in terms of providing protection. BLACKHAWK is durable enough to make sure that your knees are completely protected even during really active moments. The knee pads minimize the gaps between the bottom of the knee cap and the carrier even your knees are flexed. It sports a closed-cell padding technology that guarantees resistance against shocks, falls and bumps. Even during the hottest of days or the wettest of weather conditions, these knee pads will not retain or absorb too much moisture, thus having the ability to stay in place. Each knee pad has 2 Hook and Loop straps that are flexible and elastic to add more protection. 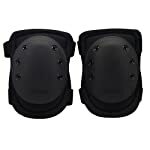 BLACKHAWK Advanced Tactical Knee Pads – made with 600 denier Nylon, the shell is definitely well made and durable. The BLACKHAWK advanced tactical knee pads boast of its top-notch flex cap design which use Nylon that is injected in seamless molds. The ledges and even the edges are contoured to fit the sides of your knees perfectly. Made of lightweight materials, movement will never be an issue when you wear a pair of these tactical knee pads. K-P Industries Knee Ultra Flex – equipped with a Manufacturer’s warranty, you can bet that this model offers more than what you expect, in terms of design and materials. The hard plastic suits the needs of every modern soldier, industrial worker or even a police officer. The straps are hypo-allergenic which means that they will not cause any skin irritation if worn directly against the skin. The straps are also sewn in place as a form of reinforcement. Arcteryx Kneecap – they are low-profile knee caps made of lightweight materials. The good thing about this is that, it is designed to protect the knees without the wearer being conscious about wearing heavy and really thick knee pads. This also tells you that you can wear these pads on a daily basis without straining or causing skin irritations, even if you wear them without your army pants or uniform on. The straps are made out of a robust elastic material to make sure that you can easily adjust and strap them on. The foam paddings are made of their signature EV-50 foam and the Caps are made of Kydex – both names are considered authorities in knee pads and other tactical military protective gears. So which brand and model came out on top? Well, out of the tests and researches that we have done, we have a clear winner: K-P Industries Knee Ultra Flex. Not only will it provide protection which extends from the top to the bottom of the knees, the design is also one of the best since it does not hinder movement despite its top-to-bottom protective features. If you are not one for a design that looks a bit restricting or you are not after a full-knee coverage, the BLACKHAWK Advanced Tactical Knee Pads is another model that is worth taking a look at. Related Video: Knee Pad Update: Blackhawk Knee Pads Any Good?